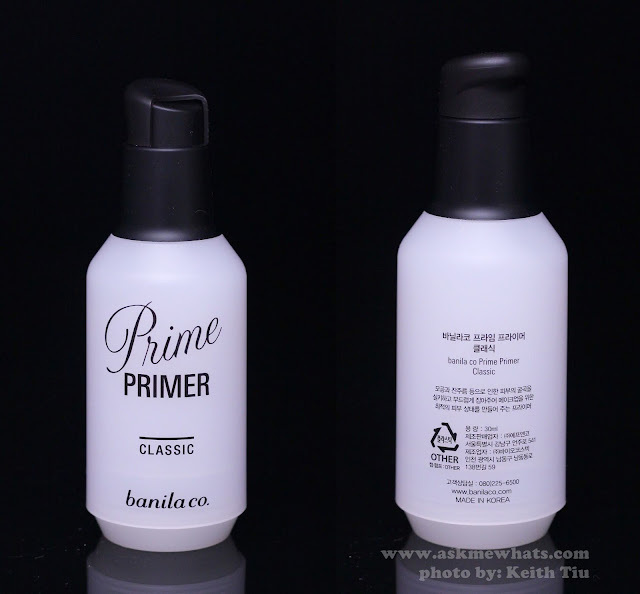 Last month, I went to the grand launch of Banila Co. in the Philippines and mentioned to you how I'm most excited to try is their Prime Primer Classic. This is a matte type of primer that I believe is meant for all skin types. If you are a fan of the Beauty Program Get It Beauty, this primer from Banila Co. is ranked first in terms of pore, cover, texture, natural and long-lasting! Now, who wouldn't want to give this a try? And I did and will definitely share my thoughts after the jump! 6 types: Classic, Classic Matte, Hydrating, Hydrating Shimmer, Anti Wrinkle and Purity. Pump packaging. Easy to control the amount of product to dispense. Pump packaging makes it hygienic too. Thin consistency and easier to apply. Glides on skin like a dream. Does not have that thick silicone texture. Gives nice finish so foundation applies like a dream. Can blur out small pores. Very easy to lose the small cap. Oil Control may be not be the best as compared to other western oil-control primer brands. This primer is similar to Smashbox Photo Finish Primer Classic (not the light version). It both has this silicone texture but the Banila Co. one felt lighter and gets absorbed into the skin faster. This primer is lightweight, non-greasy and can help minimize the look of small pores and prolong base make up. Use a pea size amount for the whole face. A little goes a long way. Concentrate application on the T-zone (to minimize shine and oil) and on the sides of the nose and nose (for visible pores). Apply only a very thin layer all over the face. Do not apply more than 2 pumps because there will be "clumps of product" forming around your face like dead skin cells. Wait a couple of minutes before you apply your BB Cream or Foundation. Use other variants to suit the needs of your skin. I personally think this Classic version would work well on users with normal and dry skin. Very Dry skinned users may go for their hydrating variant. VERY oily skin users may go for the Classic MATTE as this Classic version may not have the instant mattifying effect you may expect. Normal, Combination and Dry skin. Banila Co. is available in Glorietta 4 and will soon be available at Landmark Trinoma and Robinsons Place Ermita. It is locally priced at Php1,060.00 (approx $24.00). I like it that the pump comes with a cap! 30ml for the price may be a bit pricey for regular face primers but like I said earlier, a little goes a very long way so I appreciate this small packaging so I get to finish this tube. It has a gel-like texture that goes almost watery upon massage. The effect isn't world-changing because it doesn't blur out lines in an instant or mattify the skin, instead, what I like about this product is the fact that it helps my BB Creams and Foundation apply like a dream and last longer. 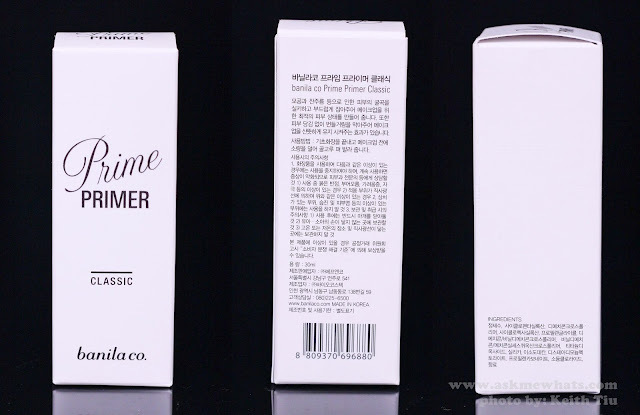 Have you tried Banila Co.'s Prime Primer in Classic? Do you have other favorite Banila Co. products you think I should try? So happy that Banila Co is already in the Philippines I swear by their clean it zero! yup, I'm testing it too and seems promising! Nice. Really want to try their balm cleanser!! They have 5 types of this primer depending on your skin type: hydrating, classic, blur, matte, purity.